The budget, which was first presented at the previous meeting on May 24, came back to the council virtually unchanged. In their forecast, city staff has projected total general fund revenues of $64.6 million. Of this total revenue, $48.6 million come from various sales tax revenue sources with sales taxes comprising slight more than half at $25.9 million. The largest single revenue source in this category come from sales taxes. As noted in the budget report, the current economic expansion is over eight years old, and "the model does identify a minor slowing of economic growth, but does not account for full blown recession." As it relates to a possible recession, the report notes "the City relies heavily on sales tax revenues of which approximately 1/3 typically comes from auto sales. If economic activity declines, auto sales and other sales tax generating activities are likely to decline. This could have a sizeable detrimental impact to the General Fund." According to Edmunds.com, May marked the fifth consecutive month of declining auto sales in the U.S. Yesterday it was reported by CNBC that General Motors is extending its plant shutdown amidst slowing sales while MarketWatch reports May saw the biggest decline in overall retail sales in 16 months due to slowing auto sales and lower gasoline prices. On the expense side, costs for the next fiscal year are budgeted at $65.6 million. 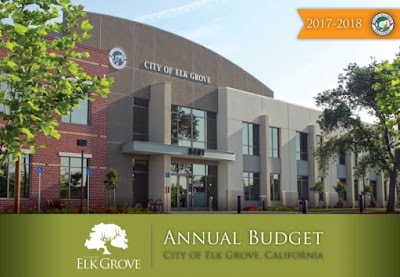 As in the past, the Elk Grove Police Department continues to account for the majority of general fund expenses coming in at $38.1 million, or about 58-percent of the total expenditures. During the next 12 months, the budget calls for the addition of four and a half full time equivalent employees on the city's payroll and average salary increases for non-represented employees of 2.75-percent. The new positions include one new employee in the economic development department, the public information office, two engineering positions in public works, and one new police officer and the upgrade of an officer from part-time to full-time. The budget for fiscal year is effective July 1, 2017. The complete report can be viewed here.